While baking biscuits run through three main changes. In the first half of the oven the structure and texture of biscuits develop. In the middle of the reduction of moisture takes place and finally, in the final third of the oven the surface of the biscuits starts to get brown. There are mainly three processes which contribute to the colouring of biscuits. – Caramelisation, Dextrinization and the Maillard reaction. All these browning processes require high temperatures and occur when the biscuits are already dried. For international suppliers of biscuits that are producing in many different factories, it is a big challenge to provide always the same quality all over the world. One part of the quality is of course the colour. 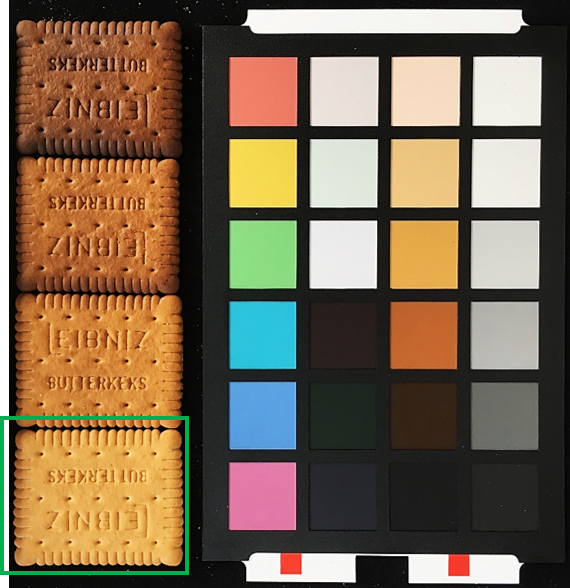 In the present example we show how hyperspectral cameras are used for true colour measurements and how biscuits are monitored for their browning. As a training set biscuit with a different browning together with a colour target were scanned with a hyperspectral camera. 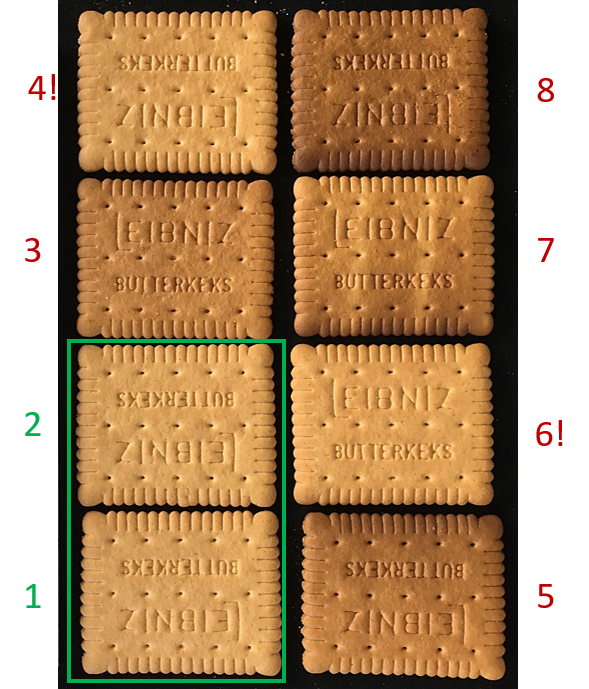 The green rectangle marks the biscuit with the original browning as you get it from the supermarket. 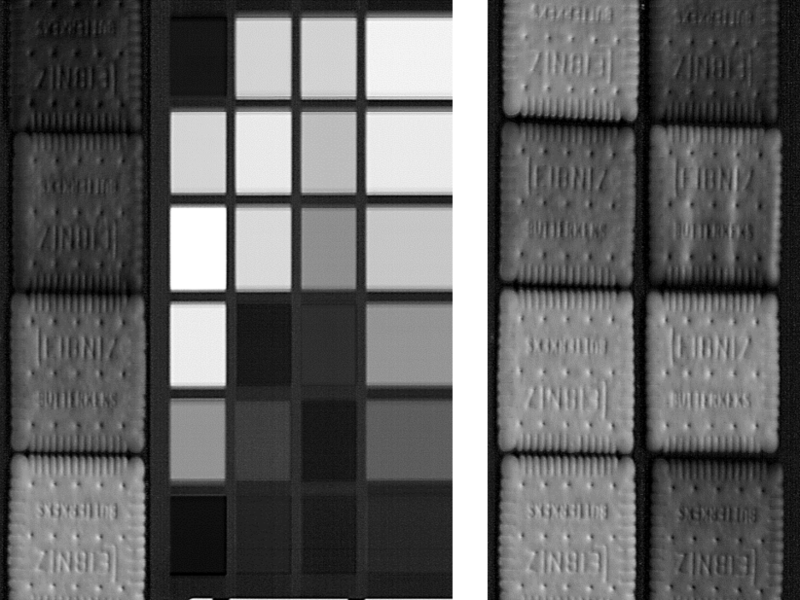 A Perception CORE was trained with the samples together with a colour target to output L*a*b* values per pixel representing the colourisation of the biscuits. The biscuits are very good differentiable by their L*a*b* values. In a next step the trained configuration was tested on a larger sample set to validate. The green rectangle marks the samples with the target quality while the other samples were baked too long. In particular the samples 4 and 6 the cannot be identified as “baked too long”. When comparing the L*a*b* values the samples which are not of the wanted quality can be clearly identified. Even probe 4 and 6 which are not differentiable by the human eye, can be identified based on their L*a*b* values. WThe L*a*b* values can be additionally modelled by the Perception STUDIO to e.g. stream the degree of browning by a grey value. This enables to provide a special purpose device for the degree of browning.